The headset is a mechanism that connects the handlebar stem fork assembly to the main frame. The headset allows the handlebar stem fork assembly to be turned with respect to the frame in order to steer the bicycle. The headset is an important mechanism that requires checking and adjustment from time to time to ensure the proper and safe operation of the Gocycle. 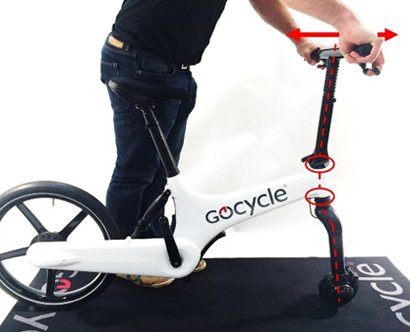 Remove front wheel and carefully place Gocycle onto a non-slip surface. Grip the handlebars and rock forwards and backwards to check for any fore-aft movement between the handlebar stem fork assembly and the main frame as shown. The connection of the handlebar stem fork assembly and the front frame should feel solid and only be free to rotate with respect to the main frame. The headset should not feel loose. If the headset feels loose, do not ride the Gocycle until it has been adjusted properly. Please download the latest G2 owner’s manual (December 2015) here and see section 7.11 for how to adjust the headset properly.